Ahem. Might it be better to have a conversation about the climate? if I think I have cancer, I see a cancer specialist.. If I am concerned about climate change, I see……a cancer specialist. Wow “extreme”. How is Laking going to characterize a multi year 1930s style dust bowl drought if it occurs? And how will he anthropogenically differentiate the attribution and health risks of a severe 2012 era drought from the severe 1930s drought? I didn’t realize Doctors considered NZCSET v NIWA to be a “Treacherous Temperature Case”, News to me – and news to the vast majority of Doctors I suspect (those that were even aware of the case that is). Another ‘scientist’ who wouldn’t have a clue about stuff outside his own speciality. There must be an alarmist manual in circulation in his waiting room – even the IPCC is more cautious about doomsaying than this lot of cretinous nonsense. That’s a good question, Mike. I would “yes”. It is defamatory, it feels like poison and yet I don’t care for myself that he said it, all I want to do is advise others that he did. The last time I went to the docs for a health checkup I had to endure several climate alarmist articles in the magazines in the waiting room. Yes, “climate change” makes you sick. I have first hand experience. Hi Andy,I know the feeling.Feed us propaganda mags when we feel ill.I watch the fish in the tanks that have not a care in the world.Thanks for your great workRichard T.There are more skeptics out there than you realize.The warmists are getting desperate thanks to you guys.Keep up the good work. The IPCC and many others perceive that increased atmospheric carbon dioxide was the primary cause of global warming. Measurements demonstrate that they are wrong. The average global temperature trend has been flat since 2001. No amount of spin can rationalize that the temperature increase to 2001 was caused by CO2 increase but that 25.2% additional CO2 increase had no effect on the average global temperature trend after 2001. Average GLOBAL temperature anomalies are reported on the web by NOAA, GISS, Hadley, RSS and UAH. The first three all draw from the same data base of surface measurement data. The last two draw from the data base of satellite measurements. Each agency processes the data slightly differently from the others. Each believes that their way is most accurate. To avoid bias, I average all five. The averages are listed here. A straight line (trend line) fit to this data has no slope. That means that, for over a decade, average global temperature has not changed. If the average thru July in 2012 (0.3431) is included, the slope is down. See what really caused the warm up during the 20th century in my stuff made public at the Climate Realists web site. The anomalies are all positive, i.e. warmer than the average. So what? There’s no rise correlating to CO2. Dan was referring to trend, not the absolute value of the anomaly. Dan, thanks for getting the conversation back to climate. Richard C – that is a good graph mate. The blue (R&S) trend line looks perfectly natural. What’s to worry about? Bob D’s handiwork Mike. Credit where credit is due – even if the judge doesn’t think so. I am amused, but not surprised, to see that this [blog] contains comments calling for Judge Venning’s dismissal for bias and corruption. Venning apparently has shares in some forestry project somewhere, thus, has a vested interest in defending “warmism”! Both science and law have yet to run full course. The science and statistics of the NZCSET 7SS still stand irrespective of the court decision. The scientific basis of the NZCSET 7SS is more rigorous than the NIWA 7SS and therefore more valid – that hasn’t changed. Law provides the avenue of appeal. We don’t know yet whether NZCSET will appeal or, if they do, what their grounds are. There’s potentially a list of grounds for appeal and vacation as long as my arm but whether NZCSET sees it that way too remains to be seen. Nothing threatening about the law or the science for us then is there Rob? Richard, the court found that NZCSET lacked scientific and statistical credibility, so I doubt that any NZer [ad hom removed] will be taking any notice of their erroneous “rigourous” (sic) figures. I do hope that NZSCET attempts to appeal the decision, as it will both magnify their “own goal” and the amount of costs awarded against them. Indeed Rob, I expect the public will be cheering that it is another victory for faceless, unaccountable government. Rob, what is the peer-review process that NIWA used? Where did they allow the public to see its methodology? What is the “international accepted” practice that they used? What is deemed a “statistical expert”? In response to the critique Dr Mullan recalculated most of the sites changed temperature adjustments applying the RS93 methodology. He concluded that the Coalition had incorrectly calculated the adjustments and if the RS93 methodology was applied correctly it resulted in adjustments close to those calculated in the review using the alternative method that NIWA had employed.. Since when was Dr Mullen a statistician? And why did J Venning favour a non-statistician (Dr Mullen) over the 3 professional statisticians that he ignored completely? There’s at least 3 grounds for appeal in that alone. Neither was the NZCSET compilation found to be “erroneous”. On the contrary, NIWA’s complaint was that it was “too rigorous”. This is an implicit admission by NIWA that the NZCSET series is more rigorous than theirs. This is both a legal and a scientific outcome and a millstone that will hang around NIWA’s neck. [ad hom removed] the fact remains, the NZ public has a choice – rigorous, or less rigorous. Until NIWA can cite their methodology their series has little validity scientifically even if the judge finds it did legally. Andy, have you not read the judgement against NZSCET? Which part of “prolix” do you not understand? I have followed this case with interest, however there are a couple of key examples which have enlightened me on the NZSCET Modus Operandi. to mean that NIWA falsified their data to deceive NZSCET, the public and the court. The NZSCET also shows some classic examples of ‘cherry-picking’ data to prove that global climate isn’t changing. The website is full of them. The global climate has always changed, and always will. But it is blatantly obvious now that there are currently major changes happening due to humans. Increasing heat in the deep (down to 2000m) ocean which is well above the noise level of the instruments give one clue. An ice minimum we haven’t seen for millions of years gives another (yes winds and other local conditions play a role, but so does the fact that the entire globe is warmer). I would encourage anyone to read Venning’s verdict. You don’t have to be a lawyer, or a climate change scientist to learn about the integrity of NIWA, and the lack of integrity of NZSCET. I would love to see the trust stick around to either appeal, or pay damages. But I have a feeling that their backers will slink quietly back into the corner they came from. I hope the leaders of NZSCET are being paid well to sell their souls and our future. I wonder if you’d have the same view if the finding was against NIWA and the judge had shares in the oil or coal industries. Given that he has already belatedly stepped aside in similar circumstances, don’t you think it was poor judgment on his part not to step aside from a case with obvious climate/carbon contention? Put another way, if he had have stepped aside, we wouldn’t be having this conversation. This kind of sanctimonious moralising really gets on my nerves. I read the climategate emails. Did I get the impression of a bunch of people who had the moral high ground? John, please explain the physical mechanism for this that attributes an anthropogenic cause. With citation of reputable literature. Sorry Richard I wasn’t replying to you but to Rob Taylor. I agree with you entirely. I almost lost my coffee all over the monitor on that one. So explain, please, how the melting ice is uncovering habitats in Greenland, and uncovering bronze age bodies at the top of the Alps? Also, since we know that the Minoan, Roman and Medieval Warm Periods were at least as warm as now, and for longer, please explain why the ice minima during those periods would not have been lower. Please provide scientific references for your claim that the current ice minimum is unprecedented in millions of years. But it is blatantly obvious now that there are currently major changes happening due to humans. The current variations are well within natural bounds. Your assertion that any current ‘major’ changes (what are they?) are due to humans is without any proof whatsoever, and remain in the ‘highly speculative’ category. I would also remind you that there has been no change at all in global temperatures in the last 15 years. I should add that even if J Venning has completely sold out of forestry he would have formed contacts, friendships and possibly allegiances that would continue after a sell down. My understanding is that – as the following Stuff article linked reports – J Venning’s investment was with Tahakopa Forest Trust in 2004 but that his involvement was “limited”. I don’t know what he has done regarding that investment since then. The question is unanswered so far to my knowledge: is J Venning still a Tahakopa Forest Trust investor/partner/unit holder etc? Increasing heat in the deep (down to 2000m) ocean which is well above the noise level of the instruments give one clue. And yet the 0-700m heat hasn’t increased at all. So please explain how the heat got down to 2000m while by-passing the top 700m. And why would this happen, when all CO2-driven warming theory expects the top layers of the ocean to experience the greatest warming, and the warming to be a top-down process? Oops sorry Magoo, I didn’t notice you’d replied to Rob Taylor just as I did. Oh well, If I’m going to dig a hole it may as well be a big one. Got to go to work all night now so can’t check it till tomorrow. Every single one of the many years of emails that was stolen off the East Anglia server? Where did you get them from? Or do you mean that you read the cherry-picked emails that supposedly demostrated that scientists were up to something dastardly? I read a subset of those emails too, but all it showed were scientists tired and upset with gamesmanship and spurious time-consuming data requests. That’s because you didn’t understand what you were reading. To those of us who had been following the debate over the preceding months and years, it was very interesting indeed. It fully confirmed what we had been seeing only from the outside, and gave fascinating insights into the private doubts and background machinations behind these people. I hesitate to call them scientists. An ice minimum we haven’t seen for millions of years gives another (yes winds and other local conditions play a role, but so does the fact that the entire globe is warmer). What are the relative contributions of “winds and other local conditions” and “global” warming? The globe is warmer than when? What human causation is there for these? References please. It’s all not going very well is it? On the other hand, you might find nothing. Um, would you believe I only do that when I get REALLY angry?! But most of the time I don’t. Given that Justice Venning’s prior interest in Tahakopa was on the public record, the NZCSET could have objected to his appointment if they thought it was relevant. For what it’s worth, I agree with Simon. I for one have no problem with Justice Venning’s appointment, and if I had I should have spoken out before the judgement, not after. In my opinion he’s taken the easy way out in his judgement, but I prefer to deal with what he’s written, not by attacking him or his motives. The past interest was but what is the present interest? What is his (or his family’s) current interest (holding)? We don’t even know exactly what the past interest was (or at least I don’t). They still can via a complaint to the Judicial Conduct Commissioner. It’s in retrospect now but why not take a leaf out of Bradbury, Peebles and Muir’s book? They were successful in their pursuit of Justice (wrt J Venning recusing himself) and they seem to be light years ahead of the NZCSET in this respect. Should be a priority of investigation IMO. Yes, there’s ample opportunity there but why not pursue every recourse that has a chance of overturning the decision? That is the aim of an appeal is it not? A complaint (if there’s sufficient justification) to the Judicial Conduct Commissioner has exactly the same aim as an appeal. I agree with Bob that pursuing the judge’s personal financial interests is not going to get us anywhere. It is already getting commented on elsewhere in the blogosphere and it takes the focus away from the scientific arguments. There may well be issues but I think they are best discussed in a less public forum. Typical cherry-picked [ad hom gone] fantasy, Bob. Do you get paid for this [sleazy ad hom removed. You know how to hurl unhumorous insults, Rob, but not how to win an argument. – RT] activity, or do you just not know how to extract a trend from noisy data? The weight of archeological, historical and scientific evidence gathered over thousands of years. What do you have? Hmm, just thought I’d mention that the global average temperature trend over the last 15 years using HadCRUT3 is zero. I feel it’s worth mentioning, considering that the model mean using the SRES balanced scenario expected a 0.2°C/decade rise in temperatures due to the ever-increasing CO2 in the atmosphere, which means we should have had a 0.3°C rise by now. Oh, did I mention it’s zero? 15 long years of no warming, during which time Mann wrote his infamous paper, we saw two of the four IPCC Assessment Reports published, Al Gore wrote his extremely funny An Inconvenient Truth, and Copenhagen failed with a spectacular Splat. I have been some what preoccupied with other matters and haven’t commented here for some time and probably I wouldn’t in this instance but in all the statements being bandied around about geological events and sources off evidence and lack thereof, a recent event seems to have escaped scrutiny. I mean “recent” in the context of geological time. There has been comment, in response to criticism of the stance of the CSET, that we do not deny climate change, let alone warming. Let us not forget that the most recent event in a geological time scale was the Little Ice Age. Putting that in the perspective of the last, say, 2,000 years, we are still emerging from the LIA. So, of course we would expect to see some warming and, curiously, the extent does not seem to be greater than the published literature on the the other events Bob D referred to would suggest. That is to say, we do not seem to be seeing more than the published variations determined for the Holocene epoch. Ice can melt because the surrounding water is warmer than it was when the water froze. The planet has warmed a lot since the last glaciation and has been warming more or less regularly since the depths of the LIA until about 2001. The assertion that it is warmer at the end of a warming period is not very profound. The observation that arctic ice is melting is evidence that warmer water got to the arctic ocean but does not mean that the planet is still warming. That the US, which occupies less than 2% of the planet surface, experienced a heat wave, does not mean that the planet is still warming. I developed an equation using the first law of thermodynamics (as a Mechanical Engineer I know how to do that) that calculates average global temperatures, for all of the years since accurate measurements world wide have been made (about 1895), with an accuracy of 88%. This includes and thus corroborates the flat trend since 2001. The equation does this using only one independent variable. That variable is the readily available, naturally occurring set of measurements, the sunspot numbers. The time integral of sunspot numbers, appropriately reduced by radiation from the planet, act as a proxy, through there influence on average cloud altitude/temperature, for energy retained by the planet. Including the influence of CO2 increased the accuracy by only 0.5%. The equation along with some of the rest of my stuff is made public at the Climate Realists website. So we now see Bob D. drop any pretence of (pseudo) scientific enquiry and merely parrot simple-minded propaganda, like any other industry shill. So, Gary, what physical net forcing is causing this? Or do you believe that the climate “of course” has some magical elastic property to it? Pseudoscientific nonsense, Dan, as the sun is showing a cooling trend. Have you never looked at the empirical data? I love the way Rob Taylor accuses other people of pseudo-science, then provides links to John Cook’s Skeptical Science. Too good. Not for no reason did William Herschel in 1801 notice the close correlation between sunspot numbers and grain prices. Advance notice gives a grain trader an enormous advantage. Gosh, according to Rob Taylor the planet’s normal climate is LIA conditions. Who would have thought that without the insight his expert input? It seems that Rob Taylor regards my pointing out that the trend over the past 15 years is zero is somehow pseudo-science, and cherry-picking. In other words, Rob, the zero trend over the last 15 years is highly significant, since (by NOAA’s own admission) it negates the models. Peterson, T. C., and M. O. Baringer, Eds., 2009: State of the Climate in 2008. Bull. Amer. Meteor. Soc., 90, S1–S196. Here’s a nice little chart that (I think) uses HADCRUT3 data and relates it with ENSO and volcanic activity. There’s a pretty obvious long-term trend there. The 15 year trend could change very suddenly if 2012 turn out to be an extremely warm year. Note though that a volcano, should one occur, can only reduce temperatures. We haven’t seen a “decent” eruption since Pinatubo back in the early 1990s, and based on currernt performance 2012 is unlikely to be a very warm year. I see the ad hominem attacks still abound. Rob, I did not comment about theories or “net forcings” (what ever that might happen to mean). I merely pointed out that published analyses of information regarding climate over the last couple of millenia indicate periods of warming and cooling which take some hundreds of years. Of course, if you are not prepared to accept those records then there will be little that I, or anyone else for that matter, can say that would convince you otherwise. If you do accept them then you must also consider that natural processes have played the only important roles in those cycles. This wikipedia article is interesting: http://en.wikipedia.org/wiki/Scientific_opinion_on_climate_change. They found that from 1979 to 2010, solar activity had a very slight cooling effect of between -0.014 and -0.023°C per decade, depending on the data set (Table 1, Figure 2). The sun is the hottest object for miles around. Anyone who claims it has a cooling effect is a few tiles short of a roof and I’m not wasting my time with them. By the way, no such statement appears in the paper. There’s a piece of deception in Cook’s “explanation”. He starts by posing the problem: “Over the past few hundred years, there has been a steady increase in the numbers of sunspots, at the time when the Earth has been getting warmer. The data suggests solar activity is influencing the global climate causing the world to get warmer.” But he never returns to sunspots and doesn’t acknowledge the proven role they have in the formation of clouds. Clouds are the greatest moderator of insolation, and no matter the level of the sun’s energy output, it remains capable of heating the Earth, so clouds are always important. Ok, we’ll check back in 15 years then. [expletives don’t improve your persuasiveness. – RT] RT and Dan, you are merely demonstrating an ignorance of the concept of climate forcing. How would you explain that from John Cook? Kindly explain how I demonstrate “an ignorance of the concept of climate forcing” and correct me. The shallow Wikipedia article added nothing to my knowledge. Bob, you present a cherry-picked technical clause taken out of context from a 2008 paper as evidence of what, exactly? “The short summary of what it means is: CO2 increases will not increase the greenhouse effect. Full stop. That is it. CO2 is not a pollutant, it will not change the weather or climate. There is no basis whatsoever for trying to control the amount of CO2 in the atmosphere. Wow. Rob, once again you completely miss the point. I tire of getting into discussions with you, since you always only see what you want to see. >Bob, you present a cherry-picked technical clause taken out of context from a 2008 paper as evidence of what, exactly? You then proceed to cherry-pick technical clauses yourself, as evidence of what, exactly? None of your points refute the simple point I made that the current 15 years of temperature stasis discount the model predctions, as NOAA themselves said. Once again, nobody is disputing that there has been warming since the LIA. Pointing at Arctic sea ice is possibly one of the stupidest arguments for AGW. We have an enormous amount of history that shows that the Arctic sea ice varies greatly and cyclically, and is subject to many other influences other than air temperature, such as winds, storms, etc., and that there have been plenty of previous episodes where people predicted it would be ice-free over the past hundred or so years. Therefore it’s well within natural variation bounds. We only have official satellite records from 1979, a known ice high point. However, we know from scientific records that the Arctic region experienced warmer periods during the Minoan, Roman and Medieval Warm Periods. And why do you ignore the Antarctic sea ice? It’s growing. They “imply”, do they? Actually no, they don’t. The CERES TOA measurements records an imbalance of 6.4W/m2. This is clearly so out of whack that nobody believes it. The only source of a radiative imbalance comes from James Hansen’s models! He claims a 0.85W/m2 imbalance in Hansen (2005), based entirely on his models, which exclude all ENSO effects, and do not in any way predict the temperature stasis we are experiencing right now. He has since revised this imbalance significantly downwards. Limited preliminary data imply that in 2008 glaciers continued to lose mass, and full data for 2007 show it was the 17th consecutive year of loss. See Arctic ice extent discussion above. Glaciers have been retreating for 10,000 years, so what’s new? Do you really expect them all to suddenly start growing? Notably, the 20 warmest years have all occurred since 1981, and the 10 warmest have all occurred in the past 12 years. Once again, why is this alarming? We have been warming since the LIA, at a very gentle rate. Why should it stop now? Still no proof of human influence. …recent observational trends are not sufficient to discount predictions of substantial climate change and its significant and widespread impacts. Given the likelihood that internal variability contributed to the slowing of global temperature rise in the last decade, we expect that warming will resume in the next few years, consistent with predictions from near-term climate forecasts. What they are saying is that back in 2008 the recent observational trends hadn’t yet showed a stasis for 15 years, therefore they weren’t yet sufficient to discount the model predictions. However, we have now reached the point where recent observational trends are sufficient to discount the model predictions. Also, they expected the warming to resume. It hasn’t. However, a single transect through an ocean basin is not sufficient for characterizing the full patterns of anthropogenic CO2 storage. Alarmists, such as Kevin Trenberth, claim that increased CO2 causes an increase in the frequency and intensity of El Ninos, but this paper finds that the mean response from climate models does not support such claims. * ENSO amplitude is insignificant in the majority of IPCC-class models. * ENSO amplitude change is not due to mean state or seasonal cycle changes. * The teleconnection response is sensitive to the ENSO amplitude change. In that case, pray tell, what is the nett climate forcing that has caused this warming? Or does the climate somehow magically “rebound” from the LIA of its own accord?? I admit?! Good grief Rob, have you really being paying that little attention? Nobody here has, to my knowledge, ever questioned the warming since the Little Ice Age – it’s your own side that denies the LIA ever happened, since they can’t account for it using their models! Remember, the low point of the LIA was in the 1600s, so the warming since then cannot possibly have been caused by humans. What a strange statement. The climate, Rob, goes through cycles, warm and cold. We don’t really know what causes them (we think we understand the long cycles, but even then there’s doubt). By ‘we’ I mean humanity, not me personally. Some people have hypothesised (is that a word?) that CO2 causes warming and cooling, but that’s obviously not true, since the LIA, MWP, RWP and MWP all had lowish CO2. Ignorance is acceptable, Rob. Science progresses steadily, but not all things are known. I haven’t yet seen a proof of what causes these cycles, if you have please let us know. Even your mate Tamino (Grant Foster) admitted that if the MWP existed (it did, of course) then it has grave consequences for current CO2 theory, since they are completely unable to account for how it happened. A superb response, Bob. Hypothesise is a perfectly fine word which describes admirable scientific thoughtfulness. Yes, not the same Andy. The link is to a vapid article which attempts to paint a picture of an all-consuming consensus. It features Oreskes to add credibility. Ignorance is acceptable, Rob. Science progresses steadily, but not all things are known. I haven’t yet seen a proof of what causes these cycles, if you have please let us know. And so we have it, at last. Bob is ignorant (more likely, willfully blind) to the knowledge gained from 150 years of climate research. Fourier, Arrhenius, Calender, Keeling, Hansen may as well not exist for him. In fact, what was the point of the Enlightenment? Better, perhaps, that we still worshipped the thunder gods and eat our food raw? OK, Richard, name a national scientific association that does not support AGW. This is why it’s pointless to attempt a conversation with Rob Taylor. The Medieval Warm Period wasn’t global and was limited to Northern Europe only. Mann et al. (2009). “Global Signatures and Dynamical Origins of the Little Ice Age and Medieval Climate Anomaly”. Science 326 (5957): 1256–60. Rob, it will be deliberately contemptuous remarks like this which get you banned. If you disagree that “not all things are known” please give your reasons. If you have evidence of what causes these cycles, please present it. When you say Bob is ignorant of everything what stands out is your own ignorance and disregard of others – perhaps even a hatred of those you disagree with. It’s a shame, because I was just daring to think that perhaps you were engaging in a serious conversation. I can only suppose that you imagine the vulgar, graceless judgement you’ve just presented might be admired outside a schoolyard but you couldn’t be more wrong. There’s no possibility of it changing our minds. Clean your act up or get lost. You’re going to have to come up with someone other than Mann, to be taken seriously. Williams, P.W., King, D.N.T., Zhao, J.-X. and Collerson, K.D. 2004. Speleothem master chronologies: combined Holocene 18O and 13C records from the North Island of New Zealand and their palaeoenvironmental interpretation. The Holocene 14: 194-208. Eden, D.N and Page, M.J. 1998. Palaeoclimatic implications of a storm erosion record from late Holocene lake sediments, North Island, New Zealand. Palaeogeography, Palaeoclimatology, Palaeoecology 139: 37-58. Summary: RWP warmer than MWP warmer than today. Can’t help but notice Rob, that you’ve studiously avoided addressing the ‘An Unsettling Look at the Settled Science of Global Warming’ series up-thread that highlights the IPCC’s oversimplification and subsequent wrongful CO2 forcing assumptions. I suppose, seeing I can’t offer anything rebuttal-wise either, that I should add my name to the list. But I’m the one doing the challenging and I suspect there’s others who subscribe to my position so there’s another list……..
Summary: MWP warmer than today. Summary: Pre-1300 warmer than today. Summary: MWP up to 0.35°C warmer than today. Simon, a quick one from South America. I have more, if you like. Andy, when you read those statements, I’m sorry to say that you have to wonder about his mental stability. “Hitler’s dreams of a Thousand Year Reich, only worse!” Wow. Entertaining, but also a little sad. “The so-called psychological studies, I find interesting and encouraging for a number of reasons. Politically, it’s the usual stereotyping of the opposition, a way of dehumanising, and therefore writing off their influence as insignificant. There’s nothing new about the particular stereotypes they’re trying to shoehorn us into, just that they’re trying to come up with some pseudo-psychological justification for it. Sensible comment from Pointman. People like Lack,Taylor, Bill, Perrott, Fenwick, Renownden etc are actually assets to us. The more they use words like “Climate Change Deniers” in articles the more the public takes them less seriously. Let them spew their abuse via the media. As Napolean said “never interrupt your enemy when they are making a mistake”. These guys have lost the war already. They just dont know it. As the ice melts, the seas rise, the deserts grow and the winds blow, fear not; the invincible shield of shared ignorance will keep you and yours safe from harm – until it doesn’t. In the meantime, keep obsessing over cherry-picked, out-of-context quotes from papers that, were you only able to understand them, actually give the lie to your beliefs. Oh, and good luck with that NZCSET appeal; I’m sure the Flat Earth Society is counting on you to do your best to overturn all those centuries of scientific oppression since the Medieval Warm Period! Um, I’m gobsmacked. You’ve not presented any evidence we haven’t refuted, yet you refuse to respond to the evidence we present to you. So in what way do you display a readiness to change your mind, when you don’t display a readiness even to engage in honest discussion? You’re a fraud. Are you specifically inviting a ban with these inflammatory remarks? If you disagree that “not all things are known” please give your reasons. If you have evidence of what causes these cycles, please present it. You give no evidence, or even a decent train of reason, so how could we possibly “adjust our minds”? You consider abusive banter an argument. You invite ridicule. I find this sort if thing incredible – it seems to suggest an inability to comprehend language around here. In one foul swoop Bob puts his blinkers on. Because in fact Mann’s work has proven very reliable , repeated by others and confirmed by th US Academy of Sciences review. Sure, certain politicians have carried out a disgstung campaign against Mann – – but that avoids the well supported science. And then Bob goes on to list all sorts of references to “prove” Mann wrong. Ignoring completely the fact these referee to regional instances where the temperature was higher in this times, not to te overall hemispheric or global estimates. The purposeful confusion of regional data with the well established and replicated overall global and hemispheric data is a common denial mantra and it’s dishonest. It’s a sign of desperation. You never fail to raise laugh Ken, it’s healthy. Thanks for your quip it’ll keep me in chuckles for days. Call again soon. The Death of the Hockey Stick? Do you see the funny part Ken? “Mann’s methodology would generate a hockey stick almost independently of the data input, by feeding it spectral noise”. Makes your day don’t it? But the IPCC itself used to believe that. It said so in the AR2. Many strands of evidence still show warmer temperatures then than now, as for example at the CO2 Science MWP Project. Mann has been so often deprecated he is without authority. Follow the link I cite and marvel at the sheer weight of evidence. One foul swoop brings back anxious memories of my bike ride last Saturday where I was being strafed by Magpies. Is it Mangled Phrase Week and we didn’t know? One foul swoop, seal level rise, and inactivists – conjures up some weird images e.g. groups of people too sedentary to be bothered to erect seal proof fences along coastlines. And they’re not moved by that evil renegade bird either (I assume he meant fowl, ha!) . Richard and Richard, I actually don’t expect any better from you. Sorry! But the fact remains that despite the extreme and cowardly attacks on Mann and his work it has been replicated and vindicated. McKintrick’s analysis proved wrong. The politically manipulated Wegmann report discredited, as was a lot of his evidence at the House hearings. And the US National Research Council’s report does vindicate Mann’s work (that’s why you guys never mention it, isn’t it?. You prefer to go with Wegmann despite the evidence discrediting him for that report and his subsequent papers. His proven plagerising and distortion of conclusions). You guys have to continue your persecution of Mann because of the icon status of his findings. Findings that are accepted by the science community and his work continues to be published despite the McCarthy like persecution. And just have a look at the titles of the papers that Bob quotes – you can see they all refer to regional measurements. It’s not honest to pull those out as evidence against Mann. Treadgold. Heard of Galileo? He shook things up when he produced telescopic evidence for a heliocentric solar system. Previously a geocentric system was accepted. That’s the thing about scientific knowledge, it is provisional and improves with time as we get more evidence. That is what happened over the medieval temperature estimates. They have improved with time. We now have a better picture than we had in the 80s and 90s. That’s why AR4 is much more authoritative than AR2. It is dishonest to demand that we go back to the past picture based on little evidence just because it fits with your ideology. Ken is a perfect example, in every way. First of all, I don’t need to prove Mann wrong, plenty of far better people have already done that. I was countering Simon’s bizarre statement that the MWP was just a NH phenomenon. By the way, you have read the Hockey Stick Illusion, by Andrew Montford, haven’t you, Ken. If not, you honestly have nothing to say about it, because you don’t even understand the issues, going by past experience. Second, Ken, showing paper after paper that all find MWPs in every region of the globe at the same time kinda proves that the MWP occurred, and wasn’t limited to the NH, no? Thanks for playing, you know the way out by now. But the fact remains that despite the extreme and cowardly attacks on Mann and his work it has been replicated and vindicated. McKintrick’s analysis proved wrong. The politically manipulated Wegmann report discredited, as was a lot of his evidence at the House hearings. And the US National Research Council’s report does vindicate Mann’s work (that’s why you guys never mention it, isn’t it?. Interesting assertion, but once again it exists alone in its fact-free vacuum. That’s the thing about scientific knowledge, it is provisional and improves with time as we get more evidence. That is what happened over the medieval temperature estimates. They have improved with time. We now have a better picture than we had in the 80s and 90s. That’s why AR4 is much more authoritative than AR2. Fair point, that’s just how science works. I agree with you. But what exactly was the new evidence, Ken? Was it that single tree way in the north of Siberia? Was it the most influential tree in the world, that lonely old twisted tree on the Yamal Peninsula? Was it another bristlecone pine, which should not be used for temperature studies? Or was it credible evidence? Let me know. “McKintrick’s analysis proved wrong” Huh? News to me (I assume you mean McIntyre and McKitrick). Care to cite the “proof” Ken? Or is this your standard Marcel Marceau rebuttal? Bob, notice you avoid your little misrepresentation of regional temperature profiles as hemispheric or global ones. I guess it’s so obvious you want to bury that for another time. It’s dishonest to keep bringing up that denial mantra – its just so obviously a distortion. Now what about you quoting from the summary of the NAS report on Mann’s work instead of cherry picking things out of context. Whatever comments you can cherry pick from the House Committee proceedings you are left with a very credible report, produced by top scientists (not selected by Barton and his political mates as Weggman was), a report which does make a few criticisms of detail (what you expect from an objective, honest consideration) but actually finds the main conclusions correct. By the way, subsequent work by Mann, corrected some of his earlier weaknesses and confirmed the main findings. As has independent work by other groups. The discrediting of Weggman actually came later when the plagerism of him and his students were exposed. It meant that a least one of their papers was withdrawn. But his original report was always suspect because of his collaboration with McKintrick which he found necessary to duplicate his mistake. Richard, you sound just like those critics of Galileo who didn’t want to give up the geocentricity they had invested so much time in. Pretending the empirical evidence was very weak so they could ignore it. All you can do is fall back on typical denier mantra – a single tree in Siberia, etc. how childish. 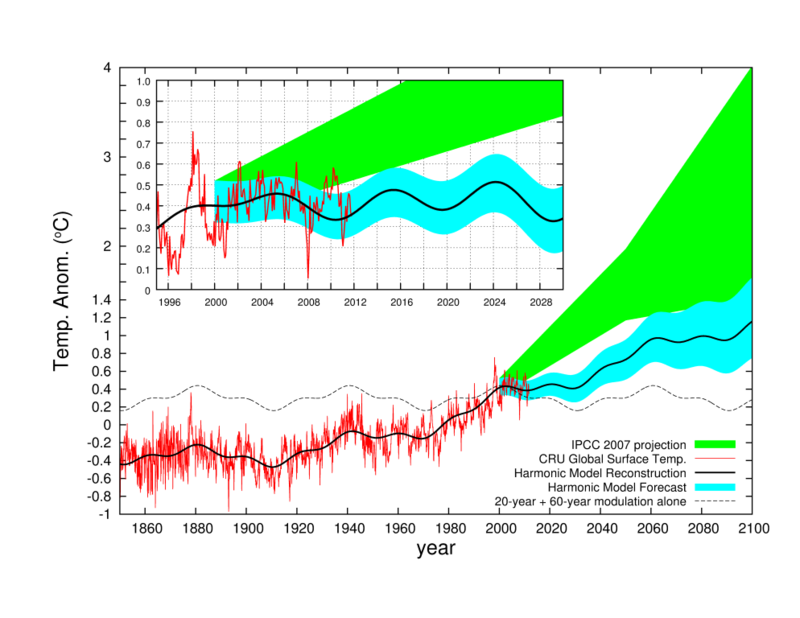 Why do you think the IPCC updated their conclusions? It was because of the overwhelming ballance of evidence – they had the job of looking at all the publications and coming to a consensus on them. Whereas you guys just hunt around for anything which counters that – happily(?) ingoring the irrelevance of theindividual regional studies you quote so greedily to the overall global and hemispheric estimates. Ok, so I was twisting your tail. Now, leaving the ribbing behind, what new evidence did the IPCC find that removed the MWP? Now what about you quoting from the summary of the NAS report on Mann’s work instead of cherry picking things out of context. Uhh, just where do you think the quote above was from? The one beginning “NAS panel”? Do you always just shoot from the hip without thinking? Ken, I’ve started a list of those who being challenged on the butchering (or should I say doctoring in this thread) of science by the IPCC, can’t offer a rebuttal of substance. Do I add your name to it or will you be THE ONE to successfully refute the case? Are you next on the list Ken with your own “denial mantra” or can you meet the challenge? but actually finds the main conclusions correct. By the way, subsequent work by Mann, corrected some of his earlier weaknesses and confirmed the main findings. It is in fact this subsequent work (Mann (1999)) that is being referred to here. Richard, so do you often do this? Present rubbish as if it were an argument? Here’s a suggestion (rather obvious but I realize you have trouble in the s Irene area). What about reading the AR4 document, identifying the research considered since the AR2 and having. Look at some if the papers – Mann’s amongst them. But his original report was always suspect because of his collaboration with McKintrick which he found necessary to duplicate his mistake. I honestly have no idea what you’re talking about here. Bob, I’ll look at my copy of the NAS report tomorrow, check your cherry picking, and quote from the summary (since you refuse to). Where did I think the quote was from? The proceedings of the House Committee – it has that format. But I’ll check and get back to you tomorrow..
Perhaps you could in the meantime apologist for quoting regional studies on medieval temperatures as if they were global/hemispheric. You have gone really quiet on that one. Unbelievable. Do you ever open your mouth without putting your foot in it, Ken? Page 4 of the Summary. Sorry Bob – we have crossed wires and I didn’t see your comment quoting from the report – only the earlier one from the proceedings of the Committee. (http://openparachute.wordpress.com/2010/01/20/climate-change-deniers-tawdry-manipulation-of-hockey-sticks/) where I have previously discussed this sort if distortion. The subsequent work of Mann’s I referred to was published (I think) in 2008, 2009). The work you refer to was what the report covered. It couldn’t possibly cover papers published later. Richard – this is just bafflegab. I can’t make any sense of what you write. Now I must catch some sleep.